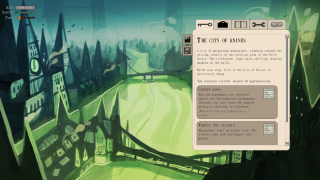 Indie developer Harry Tuffs, whose one-man studio is called Pixel Trickery, describes A House of Many Doors as a "2D exploration RPG" with an "atypical setting". Sound familiar? Tuffs openly admits that it draws inspiration from Sunless Sea, but there are some key differences. For one, where Sunless Sea is set in Failbetter's world of "Fallen London", A House of Many Doors is set in a "parasite dimension" called, well, the House. It is procedurally generated, but it's not a roguelike. Its combat draws inspiration not from the ship battles of Sunless Sea but from the likes of FTL, with screenshots showing two of the kinetopedes (steam engines with lots of legs) with which you travel through the House squaring off against each other. What jumped out at me was the idea of playing as a sort of poet-journalist who levels up by writing procedurally generated poetry, so I asked Tuffs what exactly he meant by that. He told me that one of the best ways to improve your stats in the game is to collect experiences—the examples he gave were the wonderful-sounding "Moments of Melancholy" and "Romantic Encounters"—and use them to write poems, which will have procedurally generated titles. It's early stages yet, but the game obviously shows enough promise to interest Failbetter, as not only have they let Tuffs work in their office as part of their incubation scheme but they're also partially funding the game. To make up the rest of what he needs, Tuffs launched a Kickstarter today. He wants £4,000 to pay his artist and get some music, and at the time of writing he's already made nearly £800. If you want to help, then £5 gets you a copy of the game and your name in the credits, with higher tiers to get you things like soundtracks and sketches and even a copy of a novel Tuffs wrote when he was 16. That's bold, Tuffs, bolder than I am.